With May’s crazy weather behind us it’s time to welcome back the H&8th Night Market. Last month organizers called off the event because of severe weather. Despite the clouds of the apocalypse, there had been a promise made that when the night market returned it would be even bigger and better . True to their word the organizers asked the City of Oklahoma City to expand the market’s footprint, not just in June, but for the entire 2013 season. So next Friday June 28th from 7-11 p.m. plan to grab friends and family and go down to Midtown off Hudson and 8th to go check it out. 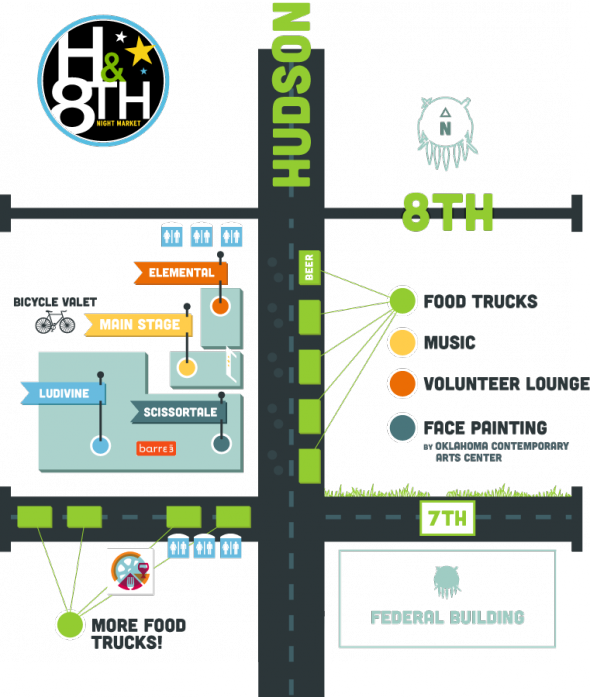 Keep in mind this food truck, music, beer and vendor block party will now include 7th Street between Walker and Hudson avenues too. As usual there will be music. The schedule is as follows: Colin Nance at 7 p.m., Prix Teen at 8 p.m., Chrome Pony at 9 p.m. and Jacob Abello at 10 p.m. E-Roy, host of “Toaster Brunch” on The Spy will DJ inside Ludivine from 7 p.m. to 11 p.m. and Katie Wicks, host of The Spy’s “SpyLab,” will DJ the Ludivine after-party from 11 p.m. to 2 a.m. According to H&8th 15 food trucks have been confirmed for June, which is more than any previous event in Oklahoma City. This list includes: Roxy’s Ice Cream Social; Heo’s Kitchen; MotoChef; Frank’s Wurst; Cupcake Queen; Off the Hook; Pizza 23; Crepe Brewers; La Gumbo YaYa; Wild Al’s; Urban Agrarian; Taste of Soul Egg Roll; Hawk’s Hotdogs, Huey’s Shave Ice and The Hall’s Pizza Kitchen. Ludivine will serve its highly anticipated Danny Bowien-inspired steamed buns menu, open seating, Elemental Coffee will serve coffee and tea, and COOP Ale Works will offer craft beer. There’s also an after party at Ludivine from 11 p.m.- 2 a.m. The Nature Conservancy will host interactive nature activities including a scavenger hunt and a hands-on exhibit of artifacts from its preserves in Oklahoma. Scissortale Salon’s monthly pop-up shop guest will be The Salvage Room. Oklahoma Contemporary Arts Center will host a face painting booth. Wine & Palette will host a group art project in the Elemental roast room: painting poppies on a giant canvas. CASA, a nonprofit that provides advocates for kids who have been abused and neglected, will sell raffle tickets for a trip for two to Los Angeles to attend the October premiere event for AMC’s “The Walking Dead.” The trip will include hotel and airfare, and an after party with the cast. Twenty percent of ticket sales will be donated to the United Way of Central Oklahoma’s May 2013 Tornado Relief Fund. Sponsors for H&8th Night Market include: Fowler Toyota of Norman, The Spy FM, Elemental Coffee, ScissorTale Salon, Ludivine, Oklahoma Farm and Food Alliance, COOP Ale Works, Thomas Productions, Mood Party Rentals and Barre3. For more information about H&8th Night Market, visit h8thokc.com or call 633-1703. Updates will be posted on Facebook and Twitter (#OKCNightMarket). Tagged beer, CASA, Chrome Pony, Colin Nance, DJ, Elemental Coffee, Friday June, Katie Wicks, Laura Massenat, Ludivine, music, Night Market, OKC, Oklahoma City, Prix Teen, The Salvage Room, Urban Agrarian. Bookmark the permalink. Glad you thought so too. It is getting better.